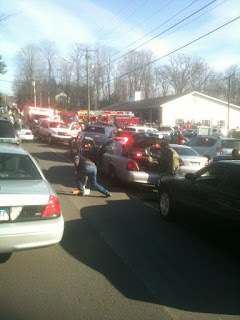 There was a school shooting in Newtown, Connecticut this morning in Sandy Hook Elementary School. The school is about an hour west of Hartford, and 75 miles N of Manhattan. Gunman was carrying two different guns, wearing full camouflage, and shot up to 100 shots. John Miller of CBS News: Second person in custody believed to be a second shooter. Bill Ritter of WABC: school shooter: guy, early 20s, 2 guns- wearing black. from ct but some link to new jersey. ABC News reports 1 shooter at Sandy Hook Elementary was a 24-year-old in a bulletproof vest with 4 guns. CBS is reporting 27 people killed. 14 of these were children in a classroom. @TheMatthewKeys: [Newtown school shooting] WVIT interviewing parent who says principal was shot and killed in elementary school shooting. Other news sources are confirming. The principal of the school is Dawn Hochsprung. Another says the school's psychologist was killed, Mary Sherlach. WABC reporting two gunmen were involved. One shooter is dead. Multiple students trapped inside a classroom. @JoshElliottABC: BREAKING: One shooter dead at Newtown (CT) elementary school after a shooting there. School has been cleared. An FBI SWAT team is on scene. Kids crying at the elementary school. 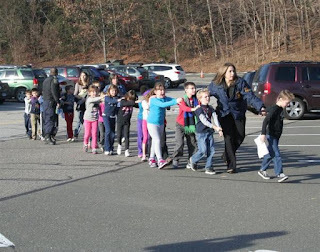 ABC says one shooter is dead at Newtown, Connecticut elementary school, school is now cleared of shooters. Shields and Davis traded to Royals?